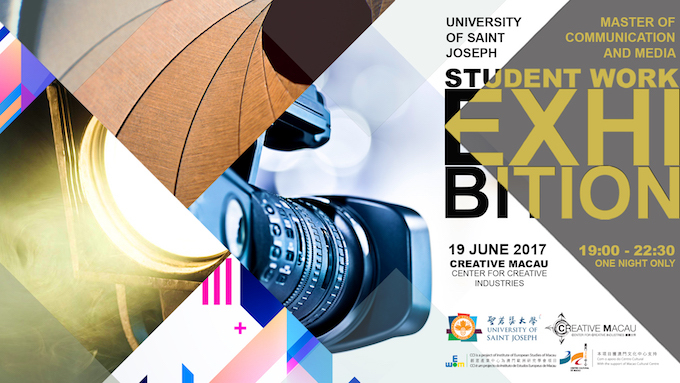 The University of Saint Joseph’s Master of Communication and Media (MCM) students are exhibiting their work “The future is now” on 19th June 2017 (Monday) at Creative Macau, the Center of Creative Industries from 19:00 to 22:30 for one special evening. The exhibition covers the areas of Audiovisual, Multimedia, Infographics and Media Law. The event aims to both share a sample of the MCM creations with the local community and to leverage individual motivation to engage further in the realm of creativity. The Masters of Communication and Media programme at USJ, is already a local academic reference in terms of combining vision, innovation, and tradition. Currently, 10 students are participating in the programme, which will be completed in the academic year of 2017-2018. The USJ Faculty of Creative Industries and the Center for Creative Industries have a long standing of cooperation with the intent of supporting Macau Special Administrative Region in its cultural, artistic and communicational diversification efforts. The exhibition is open to the general public for free. Public as well as media representatives are cordially invited to the open ceremony at 7pm at Creative Macau, G/F Macau Cultural Centre Building, Xian Xing Hai Avenue, Macau.